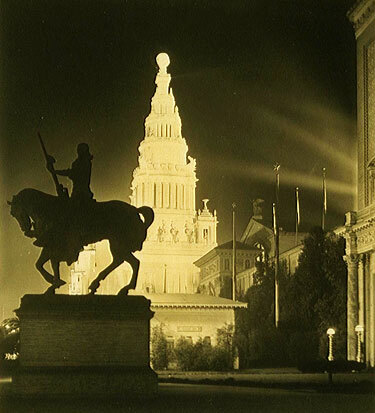 The Pioneer, by sculptor Solon Borglum, was first exhibited in 1915 at the Panama-Pacific International Exposition in San Francisco. When the exposition closed, the statues were hauled to a dump, and the buildings were razed except for Bernard Maybeck's Palace of Fine Arts. The Tulare County Board of Forestry managed to secure The Pioneer by paying only the freight cost of $150 to have it shipped from San Francisco to Visalia. The statue was erected in Mooney Grove Park where it stood until it was toppled by an earthquake on May 28, 1980. 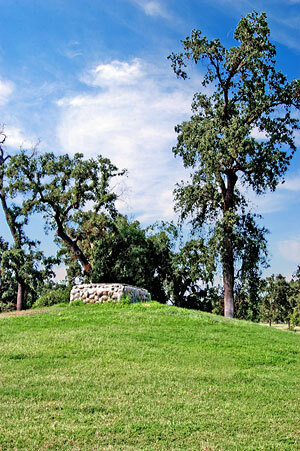 Nothing remains except the stone base on a grassy knoll at the main entrance to the park.